Gurgaon presents the best mix of residential and commercial properties to investors with a number of estates coming up in the region in quick time. If you are interested in investing in Gurgaon, have a look at property in Sector 82. Centrally located, the residential complexes in this region provide the residents with an optimum proximity to the important commercial and entertainment zones. In the last decade, Gurgaon has witnessed tremendous growth of infrastructure. Modernised roads, fast connectivity, flyovers and enhanced security facilities have leveraged the class of living in the region. The plots in Sector 82 enjoy good connectivity to Delhi as well as other important areas. 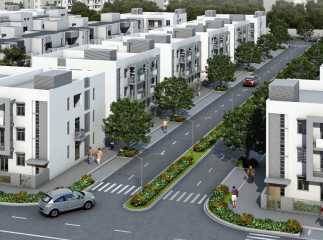 A number of developers have come up with 2 BHK, 3 BHK, and 4 BHK apartments, targeting the high-end and mid-range buyers. Hundreds of families have already migrated to the apartments in Sector 82. The spacious flats with elegant interiors provide classy living facilities. Besides, a number of schools, universities, and hospitals are located close to the projects in Sector 82. Commuters will be able to reach their destinations easily. Besides, Gurgaon is the new investment zone for several blue-chip companies. The Dwarka Expressway provides easy access to the residents in the region to the commercial areas. Besides, you can also take NH-8 to go beyond the city. Easy transportation will provide you fast connectivity to all the surrounding areas. When you shift to the villas in Sector 82, you can get an easy approach to schools like Delhi Public School, Narayana Techno School, The Shri Ram Early Years, Eden Castle Pre-School, Sispal Vihar, Indus School of Business Management, and the Millennium School. The hospitals in the area include Polaris Hospital, Ektaa Hospitals, Yashroop Hospital, Sanjeevani Hospital, and Sanjeevani Hospital. A number of important universities are also located close to the area, including BIMT Gurgaon, Amity University, and Aperture School of Photography, among others. People buying flats in Sector 82 enjoy a great social infrastructure and a cultured lifestyle. People loving green living will find the residential estates their best destinations. The roads are also being widened to accommodate high-volume traffic in the upcoming years. You can enjoy the vast open spaces, which will provide a perfect treat to your eyes. The properties in Sector 82 come with tight security facilities, along with 24 hours of CCTV coverage. You will enjoy a continuous flow of electricity and water supply. Children can enjoy their time in the dedicated play areas, while book-lovers can get quality time in the library. Apart from this, the residential complexes come with gyms and swimming pools, rolling out an ideal infrastructure for fitness freaks. You can enjoy the mornings, warming up your bodies in the jogging tracks or cycling tracks. People can also nurture their spirituality in the meditation hall. Apart from this, you can enjoy your time on the tennis court, clubhouse or green zones within the complex. Investors and homeowners looking forward to investing in property in Sector 82 Gurgaon should book the apartments now. Enjoy high standards of living, while you are close enough to the commercial areas. Enjoy a classy lifestyle, shrouded in sophistication and comfort.